Marc Matsumoto of NoRecipes shares his recipe for carrot tuna and avocado salad that you can also serve as a sandwich topped with whichever dressing you choose. Marc shares this recipe in a blog post on the Fresh Tastes blog. Put the julienned carrots and sliced onion in a bowl and add the salt. Let this sit for 30 minutes or until the carrots have released some liquid. Squeeze the carrots using a kneading motion to coax out more liquid. Grab a large clump of carrot and squeeze as much water out as you can, discarding the liquid. 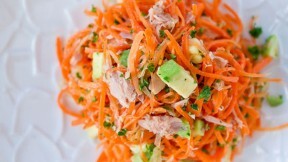 Put the squeezed carrot in a separate bowl, and then add the tuna, avocado, parsley, sesame oil and pepper. Toss to combine then adjust salt to taste.